Real Madrid backed "exemplary" club member Rafael Nadal after the tennis star was accused by a former French minister of failing a drugs test. Ex-French Minister for Health and Sport Roselyne Bachelot said Nadal's seven-month absence in 2012 was "probably due to a positive doping test". 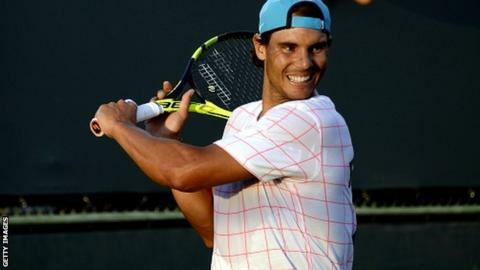 Nadal, 29, has denied ever doping and the Spanish Olympic Committee said he had passed "countless doping tests". Real Madrid have defended Nadal from "the attacks made on his person". A club statement said: "Rafa Nadal represents the fundamental values of sport. "His greatness and his incredible achievements have always been based upon a foundation of exemplary conduct, unwavering work, talent and astonishing levels of commitment. "This being the case, our institution considers the attacks made on his person by former minister Roselyne Bachelot to be unjustifiable and unacceptable." Real Madrid coach Zinedine Zidane added: "I feel bad for Rafa Nadal because he is a gentleman, a person that has shown the values he has and that everyone loves. "He is a professional and I know him a little. I feel bad for what they have said. "He has to leave all this to one side and think that everyone who loves sport, loves Rafa Nadal, whether they be French, Spanish or American." Nadal, who has won 14 Grand Slam titles, was out for seven months from July 2012 with tendinitis and then a stomach virus. The Spaniard was asked on Wednesday about the subject of doping, in the light of Maria Sharapova's admission last week of a failed test. "I am a completely clean guy," said the former world number one. "I have never had the temptation of doing something wrong."